Sure, all of the news out of Apple's campus today was about the iPhone 5S and iPhone 5C, but the iPad 5 is expected to be close behind with a similar launch event in October. With perfect timing, the 5th generation iPad is said to be featured in more than 100 new high-resolution photos, some of which compare the iPad 4 to its purported follow-up. 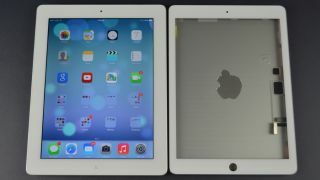 The photos, by known Apple product leaker Sonny Dickson, depict the purported iPad 5 from all angles, matching the shell design we saw in a previous video leak. The supposed new iPad looks noticeably smaller than the current iPad 4, taking cues from the iPad mini while still maintaining the same 9.7-inch screen of a full-sized tablet. Will a fingerprint sensor fill this home button hole? Now that Apple has unveiled the iPhone 5S with the latest features like the Touch ID fingerprint sensor, the question is whether the new iPad is going to receive the same treatment. Dickson's current batch of photos include the casing and the front panel of the unconfirmed iPad 5, so without the new home button present, there isn't much room to speculate. History has taught us that the new iPad doesn't always launch with the latest and greatest features contained in the iPhone. For example, Siri made its debut with the iPhone 4S, but it wasn't until the iPhone 5 launched the next year that Apple's voice-activated assistant made its way to the iPad 3, too. As the next Apple event, thought to be in October, draws closer and everyone's focus on the iPhone 5S and iPhone 5C subsides, we should find out more about the company's next tablets. Is it worth the upgrade? Check out our iPhone 5S vs iPhone 5 comparison.